As Bill Monroe is commonly lauded as 'the father of bluegrass music,' his tunes are standard repertoire and should be studied and memorized by any serious student of bluegrass. This book is a collection of transcriptions in notation and tablature taken from classic instrumentals recorded over a span of 40 years, from the early 1940s to the early 1980s. 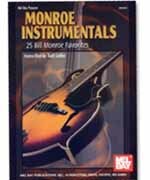 It functions as a 'fake book' for bluegrass students to learn the original melody or to study Monroe's playing style. The melodies were played by mandolin, fiddle, twin fiddles, or triple fiddles, and are grouped accordingly. Generally included with the fiddle melody is a transcription of the mandolin break. These transcriptions, along with the discography, will be an important resource for any student of bluegrass music.